Back in July Shay was present at the birth of my son and shared with you all my birth story. I was so blessed and privileged to be invited to attend the birth of Zachariah. For about a month before his arrival I had a feeling I wouldn’t be able to make it, be it child care or a middle of the night delivery paired with my sad cell phone service. I’m glad I had prepared myself for this as it was the case. I recall that about 1 AM the day of Zac’s birth I was texting a client (I’m a breastfeeding counselor) who kept apologizing for having me up late. I assured her that I was probably going to be up most the night and not to worry as my bestie had said she was having some contractions. Well, I went ahead and decided to get some shut eye at about 2 AM. At 5 AM I was woken up by my cell phone. I had two texts, both from Shay’s hubby. The first said that the midwife was on her way and the second read: “He’s here! !” Another followed shortly that read, “Your breast-pertise would be appreciated.” I nursed my son, who is now 7 months old, and headed that way. It’s a short drive but I was excited so it seemed to take forever. When I pulled up I noticed that they had a houseful. 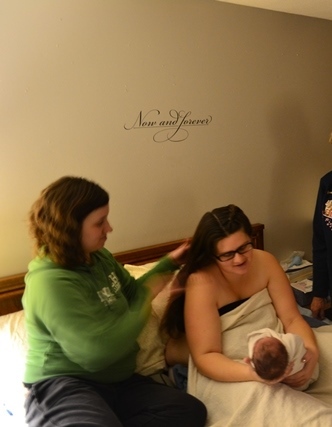 The midwife, her assistant, both Grandmas, Grandpa, Daddy, older siblings, a Great-Grandma, an Aunt…it was a party! Shay was in her room, the assistant weighing and measuring the little guy. I was immediately invited to take part. I took his temperature, helped a little with latch (though the midwife is much more hands on than myself) and changed his first poopy diaper. The assistant and I stripped the bed and I washed the sheets. (FYI - Shout and Peroxide did excellent!) I held Shay’s hand during her exam and braided her hair. I don’t think I have ever felt more like she was my own sister than I did that day. I was able to stop by at least once each day for the first week. Here lately I haven’t made it there but I try to make sure I touch base with her each day. I’m so proud of her and how well she is doing with breastfeeding. I had a similar experience as Shay did with breastfeeding my first. I, like Shay, had no plans of nursing my second. I know how devastating that “failure” (horrible word, but that’s what it feels like) feels. I’m over the moon to watch she and Zac do so fantastic. I love to weigh him and see his weight climb. She is such an amazing mom and friend. I know most of you only get the blogger side of Shay, but know that she is 100% committed to her family and they (and myself) are beyond blessed to have her.